Luther at Worms (19th century coloured engraving after Emil Jacobs). For Martin Luther, the road seemed destined to lead to martyrdom. He had been summoned to appear before the Holy Roman Emperor Charles V at the Imperial Diet of Worms to answer allegations of heresy. And so he left for Worms on April 2, 1521. It would be another 14 days before he would reach the city and stand before the emperor. A year earlier, Rome had pronounced judgment on Luther’s theology in a papal bull outlining Luther’s purported errors. But the Pope was not in Germany. If his verdict on Luther was to be enforced, he would have to rely on the secular authorities to take him into custody. Germany at the time was a collection of states and city-states with their own rulers: Luther, for example, lived in Saxony, which was ruled by Frederick the Wise. But these various states were collected together into a confederation called the Holy Roman Empire. And at the head of this collective was Charles V, who was elected Emperor in 1519 a few months following his nineteenth birthday. Emperor Charles V. (Painting by Jakob Seisenegger, 1532). Pope Leo X had opposed the election of Charles V. Charles already held extensive lands in Spain, Austria, and the Netherlands, and his elevation to Holy Roman Emperor was viewed with suspicion by many, including the pope. It was not at all clear, therefore, that the Emperor would do as the Pope asked and have Luther placed immediately under the imperial ban. As it happened, Charles V agreed with the pope’s assessment of Luther. But he did not for that reason move against him. Charles faced significant pressure on the issue of what to do with Luther, not least of which was a German populace that widely supported him. Even more troubling for Charles, many of the German princes sympathized with Luther—as did Franz von Sickingen, a Free Imperial Knight. And while Luther rejected armed confrontation in this instance, von Sickingen held no such qualms. The Knight was an experienced military commander with no small army at his disposal, and he was ready to ride to Luther’s defence. These things gave the Emperor pause. Frederick the Wise, for his part, urged Charles to let Luther be tried in Germany. Despite the protestations of the pope’s legate, Girolamo Aleandro, Charles V opted to do just that: he summoned Luther to appear before the Imperial Diet in Worms. And he further promised Luther safe passage to and from the assembly. The decision infuriated Aleandro, who denied the civil authorities had any right to hear a case the pope had already decided. Still, the invitation was not without risk: a century earlier, the Bohemian reformer Jan Huss had likewise been promised safe-conduct to a hearing. He was instead arrested and eventually burned at the stake. Many feared Luther faced the same fate. Franz von Sickingen sent a letter to Luther, encouraging him to shun Worms and take refuge in the Knight’s castle in Ebernburg. Luther declined. The journey was not, perhaps, so grim as Luther might have expected. The towns along the road cheered him as he passed through. And the people of Worms likewise turned out en masse to welcome him, with more than 2,000 celebrating his entrance into the city. Luther was rebuked and told that he should have already prepared his answer, since he knew the purpose for his appearance at the Diet. But he was granted a day’s reprieve all the same. 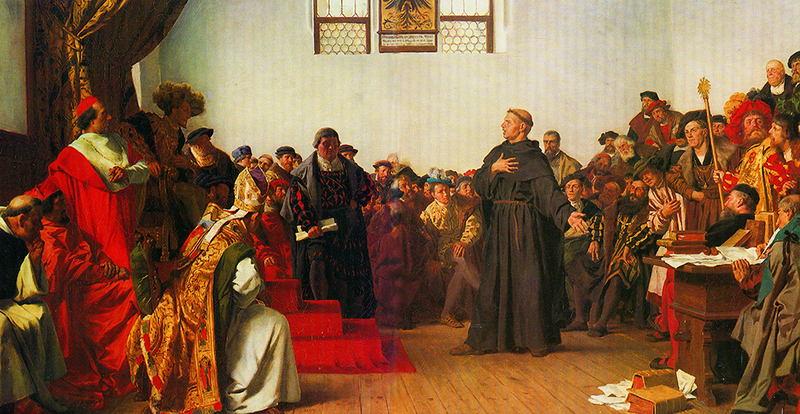 Martin Luther at the Diet of Worms (Anton von Werner, 1877). Later accounts add the oft-quoted phrase: “Here I stand; I cannot do otherwise.” And though Luther did not say the words himself, they powerfully paraphrase what he meant. There followed several days of smaller meetings where Luther was again asked to appear before committees—without resolution. And so, before the Diet could come to any conclusion on the matter, Luther made his exit. If he had thought he was marching to martyrdom on the way to Worms, things must have looked even bleaker as he departed the city. He had defied the emperor. He had defied the pope. He knew the imperial ban was imminent—and with it a bounty on his head. Frederick the Wise keenly understood the seriousness of the situation. An attempt on Luther’s life during the journey home was more than likely, so Frederick took matters into his own hands by acting first: he had Luther kidnapped for his own safety, and hidden away at Wartburg Castle. The road of the Reformation had grown dark indeed.